@TCG posted that Sophie has jetted off to the bright lights of Sydney working as a newly registered property valuer. 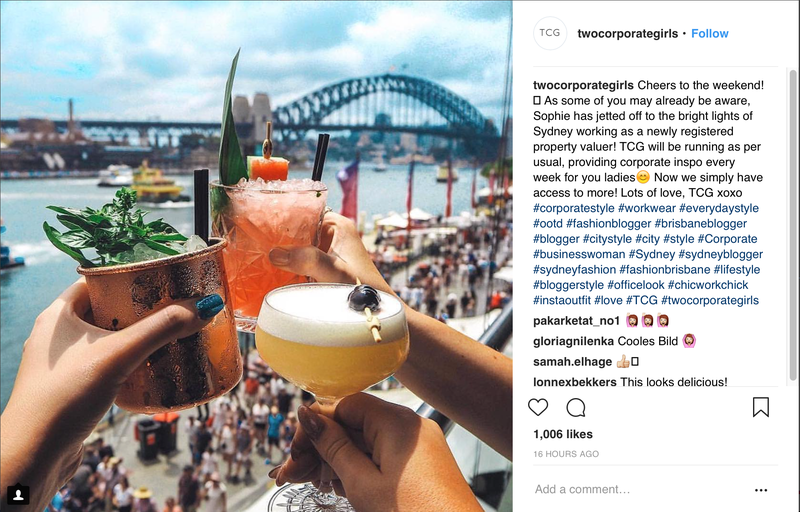 @Idlemess wrote: @TCG posted that Sophie has jetted off to the bright lights of Sydney working as a newly registered property valuer. Post below in case is disappears. She definitely seems to be placing herself to make the most of her incoming "fame". The media are flat out claiming she's the winner (a red herring if he chooses no-one) so all eyes will be on her very soon. Those cocktails look so good! Wow you're not kidding. Down from 1659 posts to now 239. She's also removed the reference to twocorporategirls in her bio, so likely IMO the missing posts are TCG-related. Makes sense to purge shilling posts if you're hoping to be offered a bunch of opportunities for rival brands. Still, cutting that many really just makes it look like you've got something to hide, IMO. Still a head scratcher about the clean up. I'm wondering if she was told to do this now. Interesting because it doesn't seem to affect the blog TCG because the goal is to bring more recognition and business to their brand. Maybe with the IG name change and clean up its more of a highlight Sophie persay and less of her model portfolio/ blog. She changed her model pic to a regular wholesome pic. Yeah it's weird alright and seems very calculated. Britt deleted a few posts and changed her profile pic a couple of times post-filming, but seems to be staying true to who she was pre-"fame". Sophie, not so much. Britt has continued with her post deletion as well but not as much. Btw, there's a cast photo. Can you bring it over. @Idlemess wrote: Britt has continued with her post deletion as well but not as much. Well... her IG is now public and it's... all selfies. Literally. All. Selfies. I think that's pretty much all I need to know.